I am writing to you to put the record straight and reassure you in respect of recent media reports about HealthEngine’s management of user data. These reports have created the incorrect impression that the health and personal information of HealthEngine users is being widely shared with third parties without their knowledge. As an online health marketplace, we believe that users benefit from having the choice to receive relevant and timely information about certain products and services. Users may elect to have their details provided to third parties for referral purposes by an express opt in or verbal consent. These value-added services aim to be helpful for users along their healthcare journey similar to those you may see when booking other services like travel. We have referral and advertising arrangements in place with a range of industry partners, including government, not for profit, medical research, private health insurance and other health service providers. Referrals do not occur without the express consent of the user. Users can still use our booking services without agreeing to be referred to a third party service provider. We at HealthEngine are devastated by the developments of recent weeks because we feel our mission of a connected healthcare ecosystem that empowers the world’s best care experiences and the cause of digital health in Australia as a whole has been set back. We are passionate about improving the healthcare system and the role digital health can play in revolutionising the access and experience of healthcare which ultimately leads to better health outcomes. As we have grown to serve millions of Australians every year and help them get better access to healthcare we have invested heavily to scale our systems, people and processes to accommodate our growth and recognise the impact we now have. This is a large responsibility and one we don’t take lightly. Nevertheless, we acknowledge that, despite being well intentioned and trying to innovate in health care, that recent media coverage has damaged the trust we have built up over many years with our users, customers and industry partners. Health care is a sensitive area and we have heard the feedback we have received from our customers and users that they are concerned about data privacy. In order to restore their confidence in our management of user information, we have decided to make substantial changes to HealthEngine’s business model around advertising and referrals. We are finalising the arrangements underpinning these changes and are on track to make an announcement within the next week. Moving forward, we will continue to consult with our users, customers, industry partners and relevant regulators to deliver better health outcomes. We sincerely hope that by taking the steps we are about to take and by being open to more feedback and learning that we can regain that trust and continue to have the opportunity to deliver the value to the healthcare sector and millions of our users in better ways than we have done before. HealthEngine today notified a small group of users of a data breach during which their identifying information may have been improperly accessed via HealthEngine’s Practice Recognition System on its website. Due to an error in the way the HealthEngine website operated, hidden patient feedback information within the code of the webpage was improperly accessed. This information is ordinarily not visible to users of the site. Of the more than 59,600 patient feedback entries that may have been improperly accessed, approximately 75 entries contain identifying information. HealthEngine has reported this breach to the Office of the Australian Information Commissioner, as is required under mandatory data breach reporting law, and has also notified the 75 individuals who had included identifying information in their feedback. The information that may have been improperly accessed does not include any account details such as user names or passwords. Importantly, no information from the health practice, such as patient records, is held by HealthEngine. No action is required to be taken by users of the site. HealthEngine has worked around the clock to investigate how the information was improperly obtained, what patients might have been affected, and the steps required to address the matter. We have removed all published patient feedback from our site while we review the HealthEngine Practice Recognition System, to ensure that hidden feedback information can no longer be accessed in this way. We take data security very seriously, and acted swiftly and decisively when we became aware of the breach, to identify the error and shut down the published patient feedback function of the Patient Recognition System on the website. The published patient feedback function will not be reinstated until we are confident the error has been corrected. HealthEngine is Australia’s largest online health marketplace and we put thousands of patients in contact with health professionals across Australia every day. We respect the privacy of our users and appreciate the trust they place in us. We do have referral arrangements in place with a range of industry partners including government, not for profit, medical research, private health insurance and other health service providers on a strictly opt-in basis. These referrals do not occur without the express consent of the user. 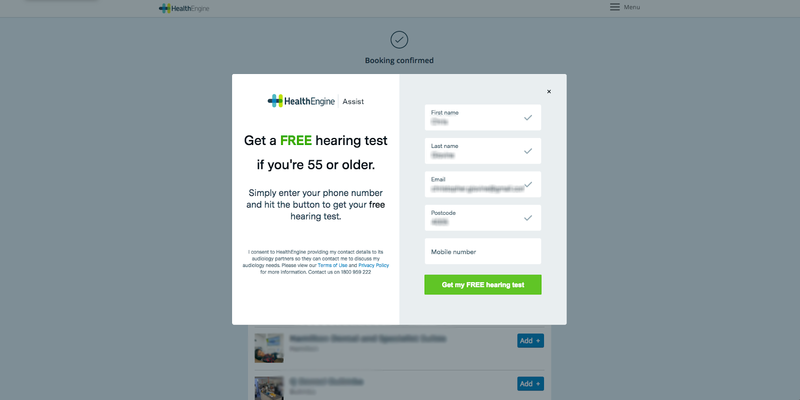 Contrary to the ABC report’s suggestion, consent to these referrals is not hidden in our policies but obtained through a simple pop-up form as part of the booking process (see below) or provided verbally to a HealthEngine consultant. Consent to these referrals is entirely voluntary and opt-in, and we do not provide any personal information for the purposes of a referral without this consent. This is a typical example of an opt-in pop-up which enables users to provide their consent to receive referral services. There’s no obligation on a user to complete or submit this form. These referral services are provided as a value-add to our users who opt-in to the service, in order to help them access the services they request at relevant stages of their health journey. Users are able to continue to use our booking services even if they do not provide their express consent to being contacted by a referral partner through the pop-up form. HealthEngine has no referral arrangements in place with marketing agencies or law firms. Under previous arrangements, HealthEngine provided referrals to law firms but only with the express consent of the user. Our referral partnerships remain constantly under review to ensure patient feedback is taken on board and patients are getting access to the services they request. I want to make it clear that HealthEngine is unable to access patient data held by My Health Record or the Australian Digital Health Agency. For more information on data privacy at HealthEngine please refer to our FAQ. I’m writing to update you on our response to recent media reports about HealthEngine's Practice Recognition System (PRS) and user data privacy. Until recently, positive patient feedback on medical practices has been published on the HealthEngine website through the PRS. The PRS was intended to operate as a positive, aspirational, recognition system, where only the practices rated highest by the practice’s own patients appeared. Media reports have suggested that HealthEngine may have misled users by removing negative comments from patient feedback under the PRS. We take these claims very seriously. The trust of our users and customers is important to us and we want to be sure that users clearly understand the information they obtain from our site and that the operation of our PRS complies with all of our regulatory obligations. That is why we have removed the published feedback component of the PRS from our website pending robust internal and external reviews. Consistent with these aims, we edited some user feedback to seek to ensure that it complied with the National Law and AHPRA Guidelines and with our positive intentions for the PRS. While many of the edits were minor and required by law, it appears there were occasions when our editing went beyond what was required under our regulatory obligations. In relation to published feedback, our process was to email all users to let them know that their feedback may have been edited. All the practice’s patient feedback, positive and negative, is provided back to the practice unedited. Over the last three years, we have received very few complaints about the way we have edited published feedback. Nevertheless, we are seeking to work with relevant regulators and will act decisively on the outcomes of the current reviews to ensure our processes meet best practice standards. For more information on moderation of feedback at HealthEngine please refer to our FAQ. HealthEngine affirms its position as the leading online health marketplace partnering with global dental software experts, Software of Excellence. Brisbane Times Would you book your GP online? Sydney Morning Herald Would you book your GP online? Why is it always a public holiday when you slice off half a finger? New startup to make healthcare more clickable. HealthEngine launches Australia’s first Apple Watch app to find and book health appointments. HealthEngine's iPhone app has been recognised as one of the top ten free medical apps, a featured app in Apple's "Made In Australia" app room, as well as the top "What's Hot" medical app on the App Store.